Benefits cholesterol, brain function, cancer, diabetes. 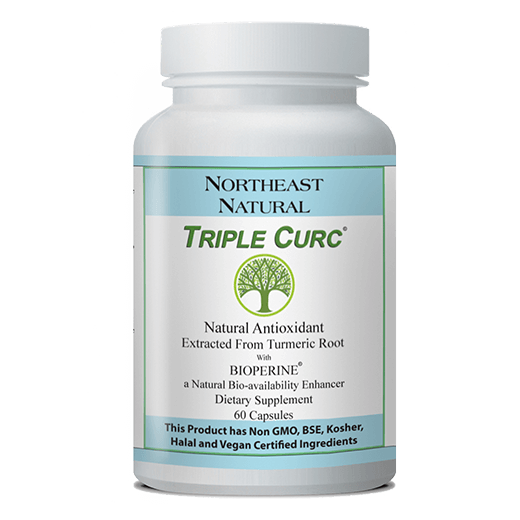 TRIPLE CURC® is made of a patented formula of Curcumin extracts (C3 Complex®) with Bioperine®, a natural thermonutrient that greatly increases bio-availability. Ingredients are certified NON-GMO, NON-BSE, GRAS, Vegan, Kosher, and Halal. Manufacturing facility is NSF certified free of impurities or contaminants. Research on benefits of curcumin being studied at UCLA School of Medicine, MD Anderson Cancer Center, University Hospital of Cleveland, Tufts Univ School of Medicine, Mass General Hospital, & Penn State University. Just ordered my 9th bottle! These little vegan, non-gmo tablets are a lifesaver. Thank you Triple C! My back doctor recommended Triple Curc to help with my lower back pain, and I must say that after 2 months of taking these supplements my back pain is not as severe every day. After trying many other curcumin supplements, a family member told me to give TC a try. I have now been a regular customer for 6 months. Thanks for such a great product! I start every day with Triple Curc. Highly recommend. I Have been using Triple Curc for the last 3 years. It was recommended by my Orthopedic doctor at HSS in NYC for my lower back pain. It has helped tremendously with inflammation, lessening my overall pain over the years. Win Win for me!